My forum name is phoenix827 but I go by Ben Sellers. My Father and I completed a bike last year. I've been running on used cooking oil. The engine seems to really run well on it. 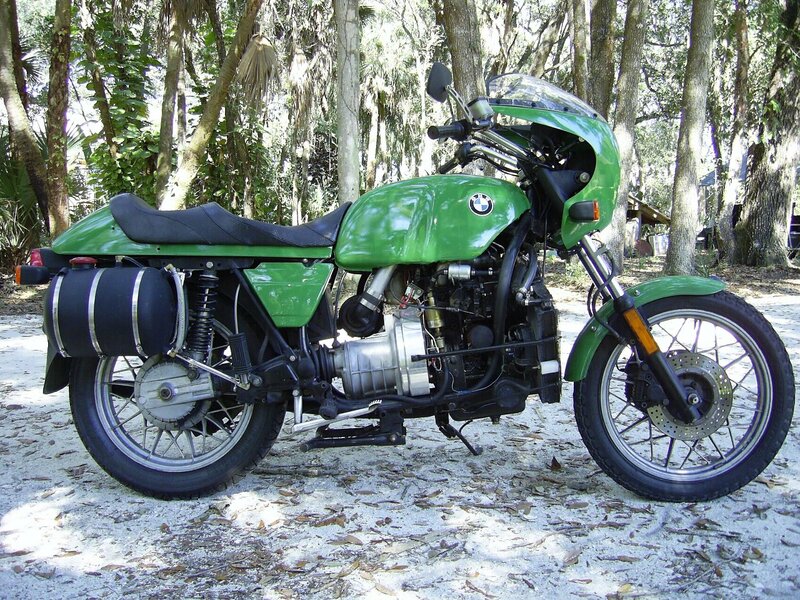 Seen very interesting, cool bikes on the site and realize there are very few here that understand my bike. Wanted to be able to communicate with more like minded people. My bike was a Honda CM400, now it has a sterling 10HP diesel and variable belt drive. We made the transmission from a piece of 4 inch by 4 inch steel box. We bored holes through, bolted in bearing assemblies then cut our own shafts. We custom built the lower frame and the jackshaft drive case. I uses 10hp Sterling diesel engine. I run cooking oil in it. The tank is from a sportster, the drive from Comet and we bought the pulleys from a bearing distributor and other parts are from an industrial vacuum. We call it Mutt. It's not fast, but it's a whole lotta fun. Plans for fall/winter include five speed from a Kawasaki, stretching frame with a lowered seat, and build custom front end. I average about 110 miles to a gallon. Shades of the American Turbine bike here only I suspect this one is not quite so expensive. The frame is Suzuki GT550 while the turbine is a GPU (from a NF 5 Fighter) which is about 30 years old. It pumps out 90hp at 58000 revs (phew!) and with the bike weighing as little as 160kg you had better be careful if you ever get to ride this machine. Turbines run on kerosene but you only have to detune a little to get them running on good ole diesel. More details here at Submachine. Just follow the Bike link. Hang on for a fast ride folks! Turbines are the order of the day here. Thanks to Emile. Andreas Loersch and his K 100 R-S Mercedes Smart Motorcycle. 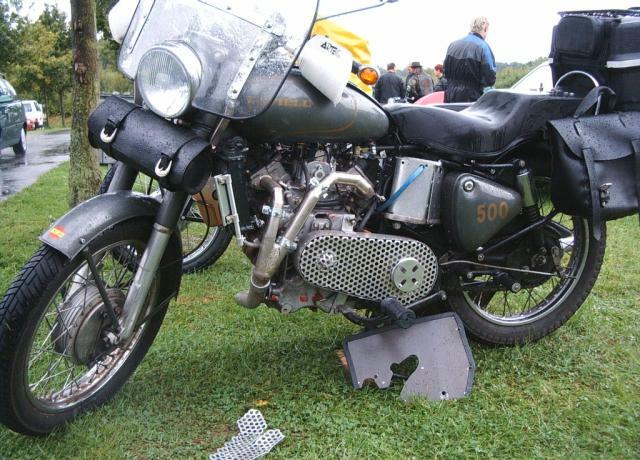 We've seen this motorcycle make a appearances at the 2009 & 2010 Hamm rallys. Andreas Goschel has built this machine from a 1994 BMW and chosen to fit it with an 800cc Diesel Smart engine. The 1994 BMW complete with Smart engine. 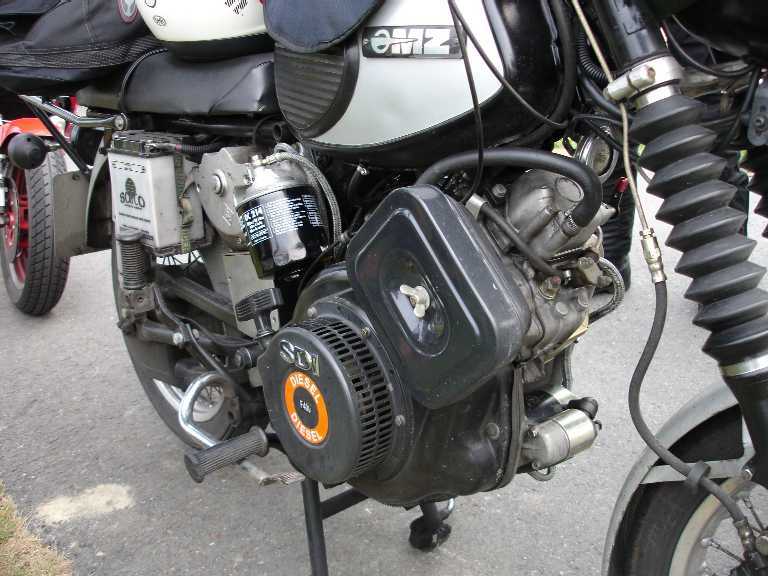 This motorcycle has attended German & British events and is well travelled, proving the reliability of the privately built electronic control systems. This is an early picture of the the bike. This amazing looking machine was recently shown in Holland. Details are as follows: Engine is a 1200cc three-cylinder out of an VW Lupo 3L TDI. It originally produced 61 hp and 140 Nm. With Chiptuning it has improved to 90 hp or 210 Nm. For more information and pictures go here and here. Talk at the British Rally was that this bike has some mechanical problems yet to be overcome. 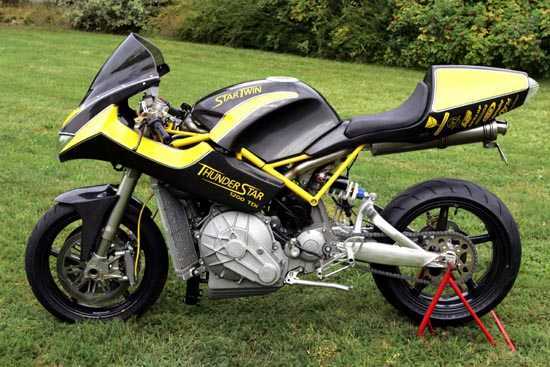 SHOCHSTER Turbo 1500 Diesel Motorcycle. If you've any details on the above bike please forward them on. I think it has a Mercedes engine. More info here. 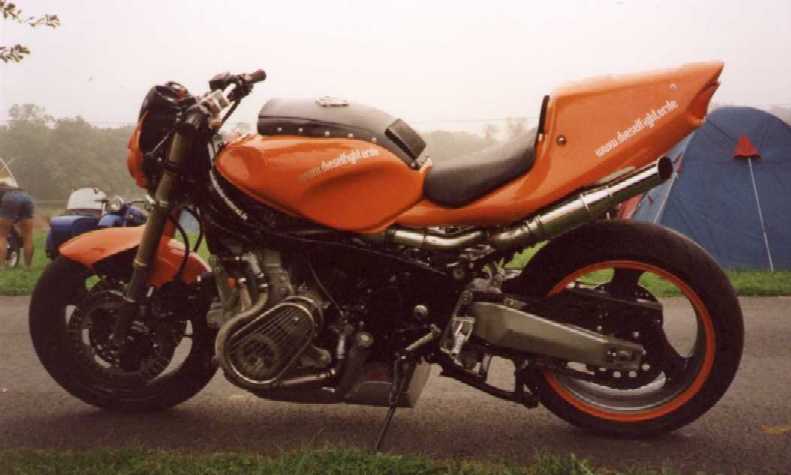 This Honda CBR 1600 Turbo Diesel was put together by Werner Bratenstein. The engine,coming from a golf 2 V.W. gives the bike a rather wide look when the fairing is fitted but the specially strengthened frame has no problem handling the weight of the power plant. Honda CBR 1600 Turbo. 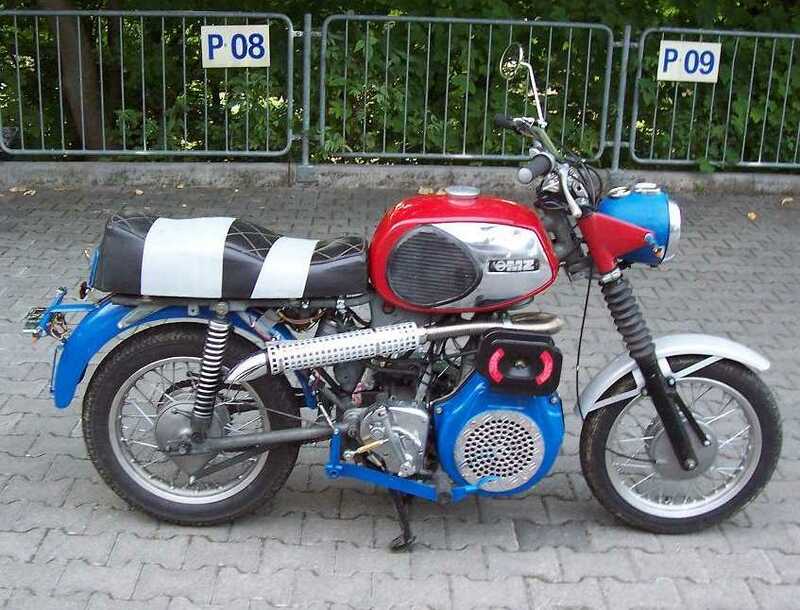 A bike that certainly got noticed at the Hamm 2003 Rally. 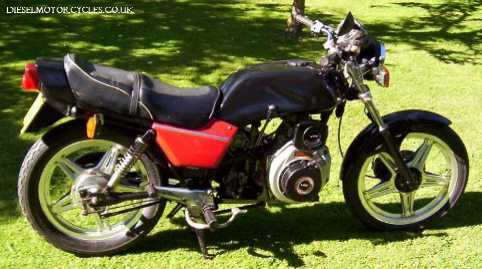 A golf engined Kawasaki that really looks very desirable. More information here. My names Dan and I've been reading the forum for a long time now. I really like motorcycle touring and figured that economy wise my current mount SR500 had to me a short range. 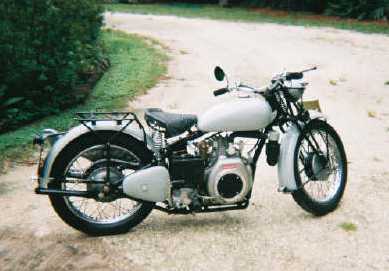 I like old bikes then I found out about Indian Enfields. They have all I'm after: 350 or 500 single right side shift 4spd and ok mileage. After more surfing the net I discovered people had been fitting Diesel engines into 'em and getting extremely good mileage. 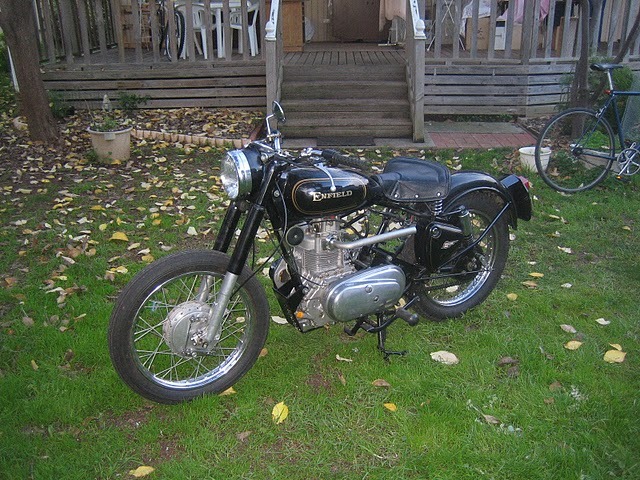 I know a Diesel powered Enfield is nothing new but heres another one to the list. I've only got about 70kmls on Diesel so plenty of testing and long distance riding up ahead. At the moment it rides very well, much more enjoyable than in previous 350 form. For me there is not much difference performance wise between the 350 petrol and this. From what I read I was expecting it to be really slow especially up hills. Well I tell ya I was in for a surprise. For 10 horses it moves well up 15% grades. Very pleased. Dan. Dan got some help rom his brother building this bike. 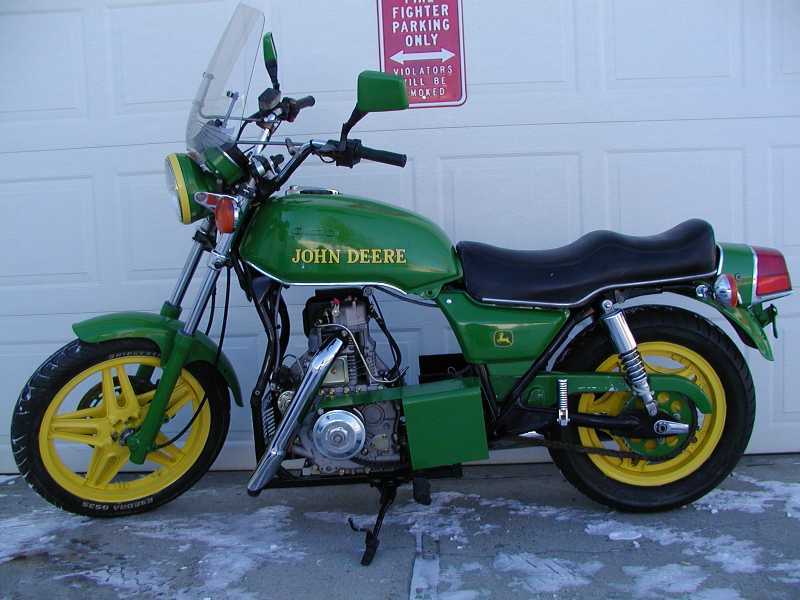 Sam tells me his bike has a john-deere/yanmar engine ( TNA-72. 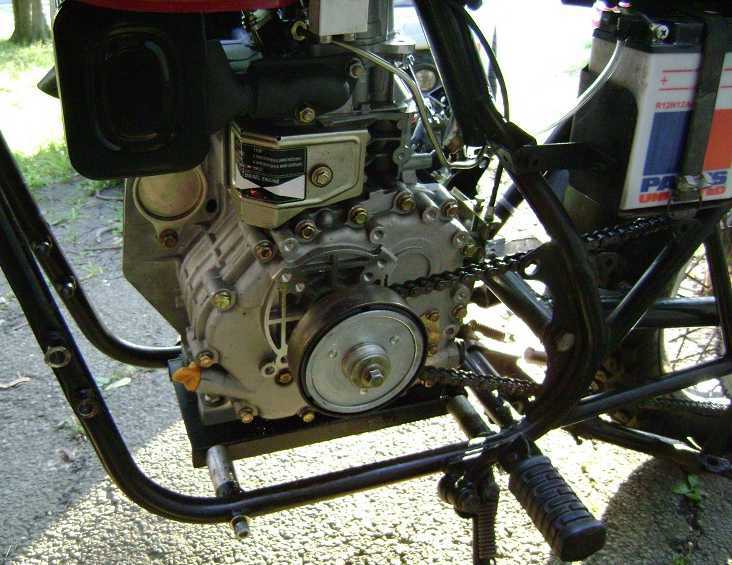 3 cylinder about 900 cc displacement.) He made a billet flywheel and bell housing so the original clutch fits. The transmission is original. The fairing was removed and headlight brackets from another bike were used. The forks are two inches longer than stock to give additional clearance to the front wheel/engine assy. Iit runs on ordinary diesel and he's used it also on 100% canola oil by CRISCO company (cooking oil) as a test. No difference in performance experienced except starting a little bit hard. Thanks for the info Sam in washington, pa. This machine is now owned by Dave who tells me this bike has a top speed is 63 mph Best fuel gets 70 mpg at 55 mph. It loves biodiesel. I have repainted it added a faring and the tail section around the seat and have added duel tanks. I have reoutfitted the tubing with biodiesel compatible tubing and hooked up an electric switch to go from tank to tank. Future modifications may include getting a tall fifth gear to up my top speed and up my miles per gallon at 55. Save this shot to see it bigger. Two picture's of the Yanmar Ariel. A close-up of the engine and a shot of the finished bike By Dr Robert Harms. More Information here. 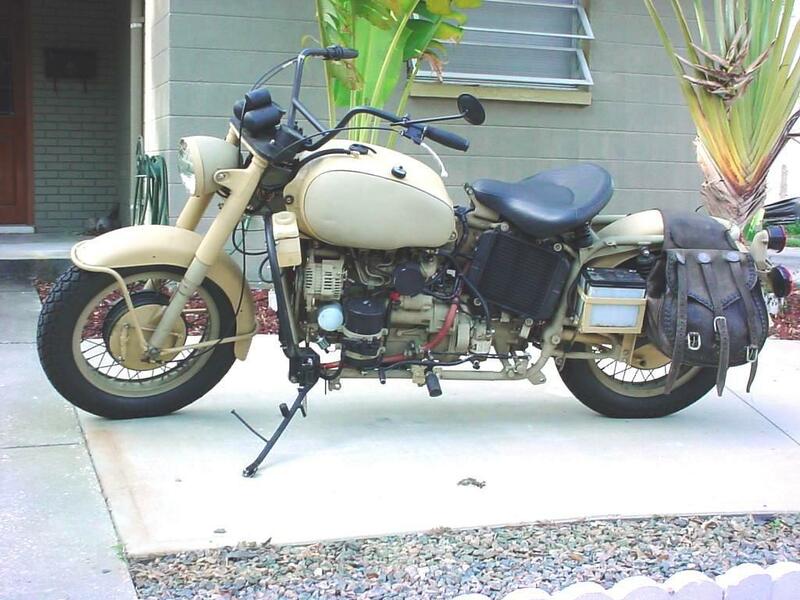 Many thanks to Mitchell Green from down Tampa, Florida way who sent me details of his great looking Moto Guzzi conversion. 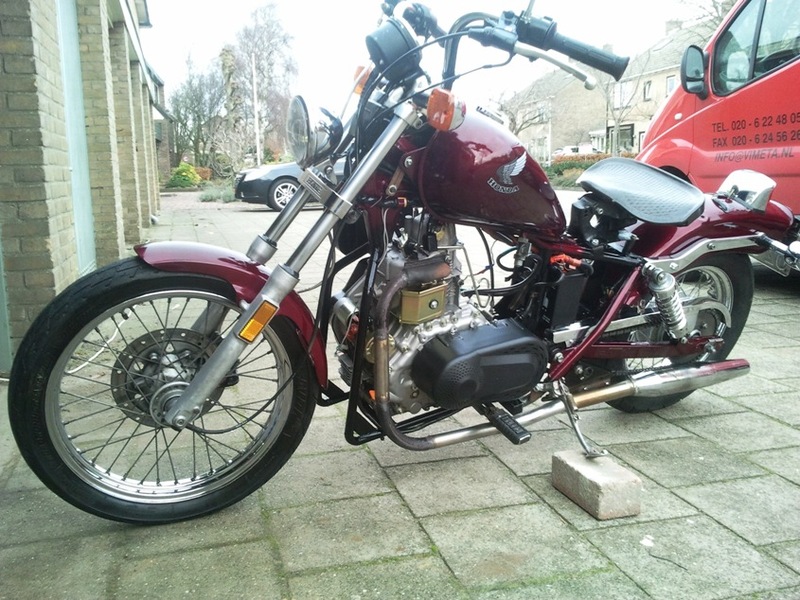 The bike dates from 1971 and has been fitted with a Yanmar 3GM30 Diesel engine which gets about 65 to the US gallon. Mitch tells me he will be improving the top speed of 74 mph and adding a gun mount in the near future. I think you'll all agree that this is a very well proportioned motorcycle. 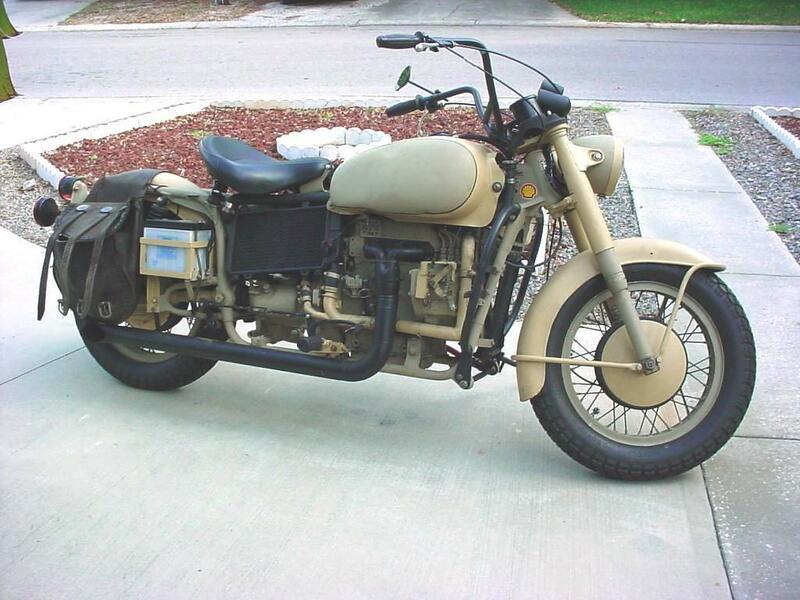 A look at the left side of this Moto Guzzi Diesel Conversion. Here we see a machine constructed in 2006 by Richard Coles. 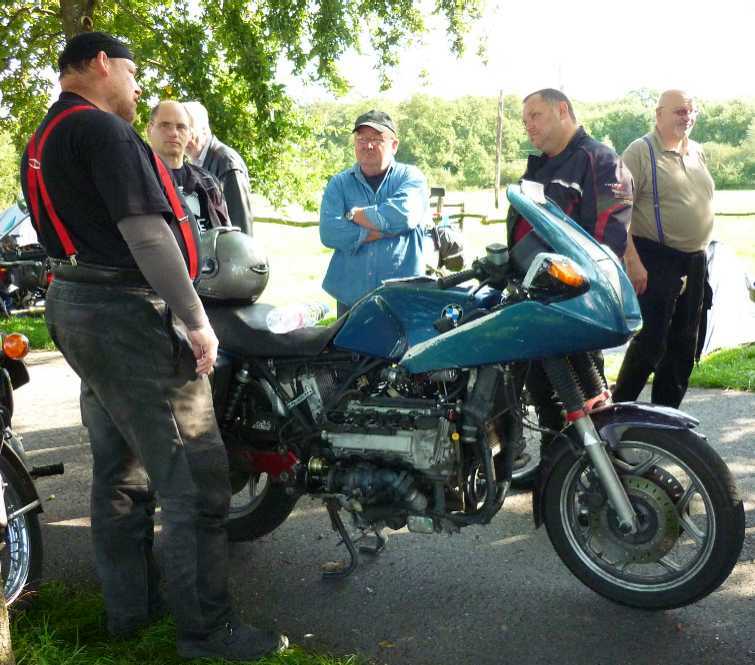 Based around a Suzuki GSX 250E, this motorcycle has had its engine replaced with a 406cc Yanmar L100 (taper shaft). Gearbox is a 3 speed pre-unit affair with the shift lever fitted up by the tank. Read the build report on the main page of this site. Another Diesel Motorcycle from the U.K. This machine has at its heart a 750cc V twin Yanmar engine. This picture was taken at 2004 Rally. The engine cover came off later but I only have that on video. I'll try and post when I can. RE Yanmar 750. The 500 relates to what it was. 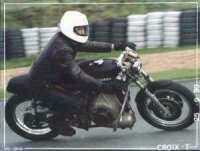 Derek Walters recently unveiled his Diesel motorcycle to the British public in via the pages of Old Bike Mart. 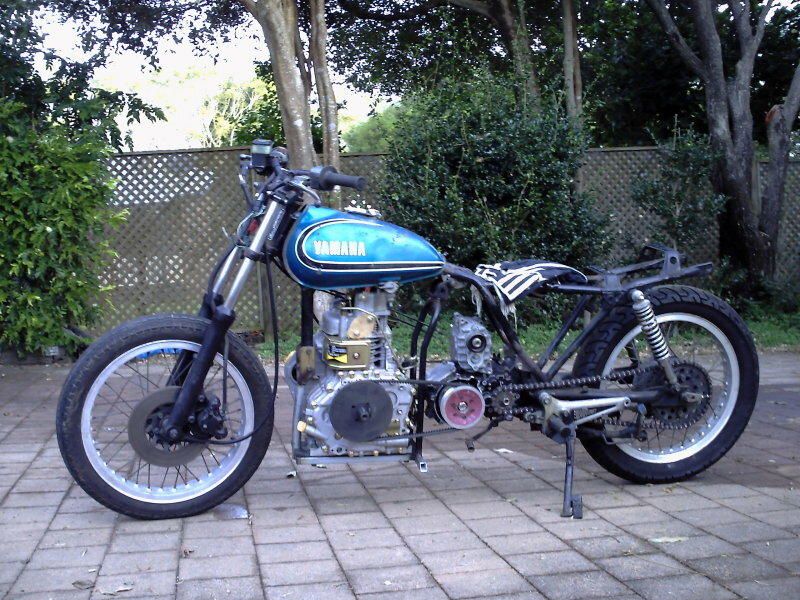 It consists of a Yanmar 308cc engine fitted into the frame of a Honda CB250RS. Brakes, wheels and gearbox (cut out from oringinal engine) are all Honda. 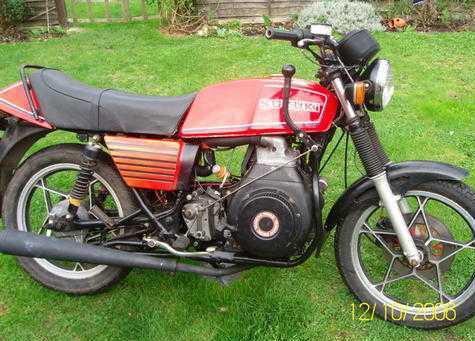 However the seat and tank are from a Suzuki GS125. Derek was inspired to build the machine after meeting Ernie Dorsett on a Steam Boiler Course. The engine can revto 3600 rpm and top speed is around 50 mph. Mpg is in the region of 120. This bike was recently featured in the Old Bike Mart. A pleasant surprise for 2005 here. Sam Brumby informs me he has built 2 Diesel powered bikes and this is one of them. 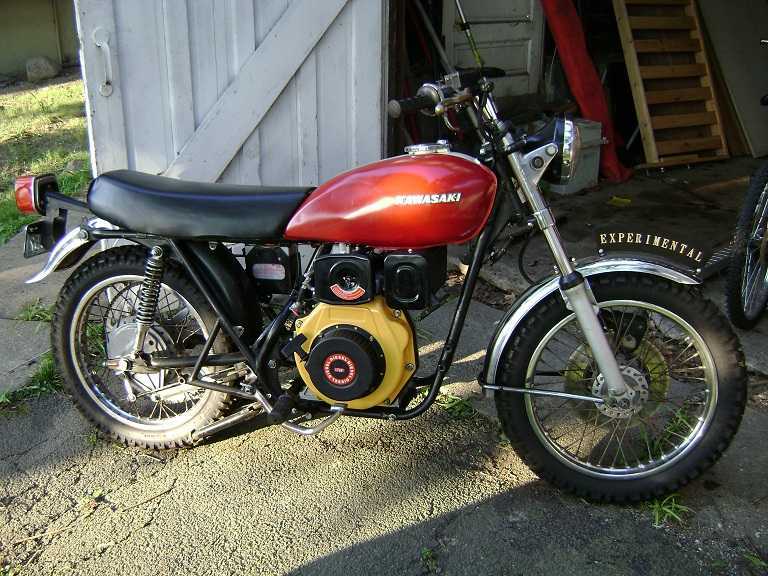 A CB400 powered by a Yanmar 275 engine. Sam tells me he built this machine in a week back in April. The engine is started with the pull start seen here on the right hand side. 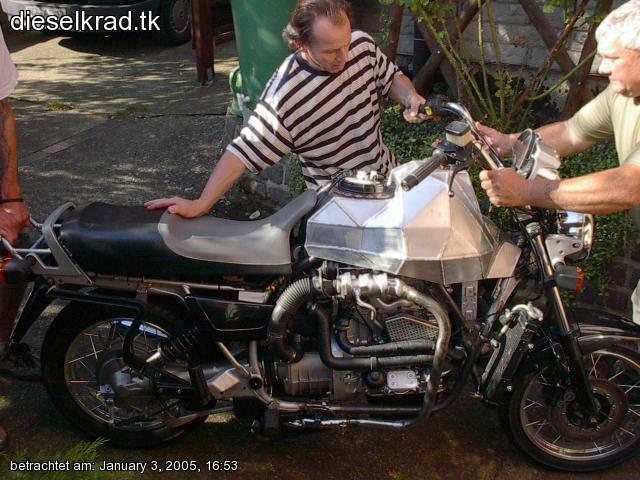 This machine was built (I think) by Bernhard in Germany and consists of a 1 cylinder Yanmar engine of 406cc fitted into a Suzuki Marauder Frame. The Diesel Wiesel - what a great name. To find out more go to the homepage here. 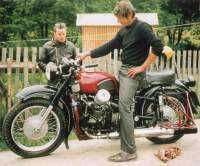 The frame is a Dnepr but I have no idea about the origins of the engine (unless its a Karpaten). My forum name is Honda John, but I go by....John. 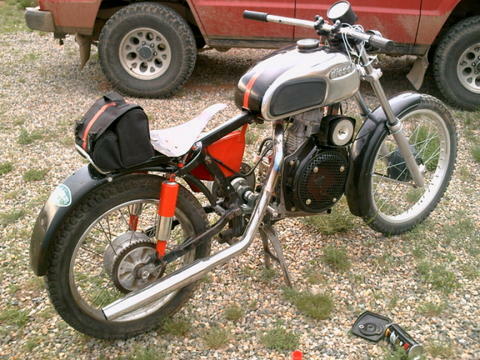 My first project was based on a wrecked KZ400 that my friend picked up as a parts bike. I traded him a box of carbs and got a solid roller, minus engine, wiring loom, tank, and seat (all the easy and cheap parts to replace). I bought a clone of a Yanmar L70 from Ebay, welded in some extra frame lugs, and mouted it on a chunk of heavy duty C-channel that I milled down. As a recent college grad with no money, and since I wasn't planning to put it on the road anyway, I didn't use a transmission or stretch the frame in order to keep the cost down (the fact that the frame is twisted and the rear swingarm is seized helped too). I installed a massive custom rear sprocket and used a centrifugal clutch on the output shaft. Its great for messing around in parking lots and rides like an old Rupp mini bike, but it can't do hills at all. I will definetely figure out a gearbox next time around. Anyway, I'm happy I stumbled on this forum. Its good to know I'm not the only person out there with too much free time! Shots of both Johns Clutch and rear sprocket. Thanks John! I'm kurt and live in belgium. 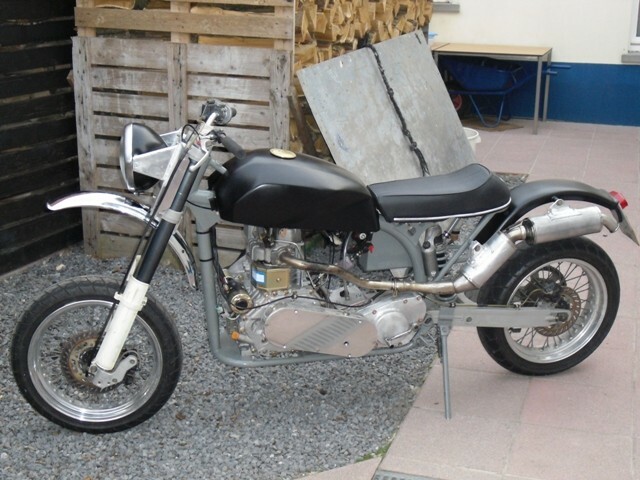 I have been busy all winter building my own diesel bike using a Husqvarna TE350 as donor bike. I bought a Yanclone 9hp engine and streched the frame and reused the original engine gearbox. Other parts used are from Honda, Triumph, Suzuki and even truck parts (head light). 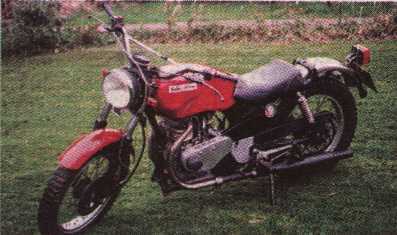 Kurts Diesel Motorcycle. Cheers Kurt! 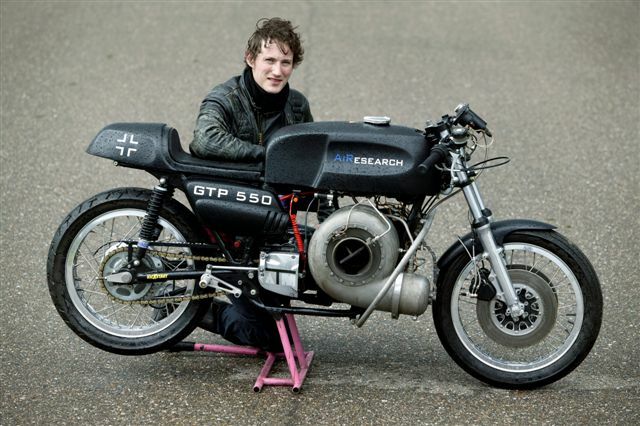 Petter Holte's Moto Guzzi Diesel Motorcycle. 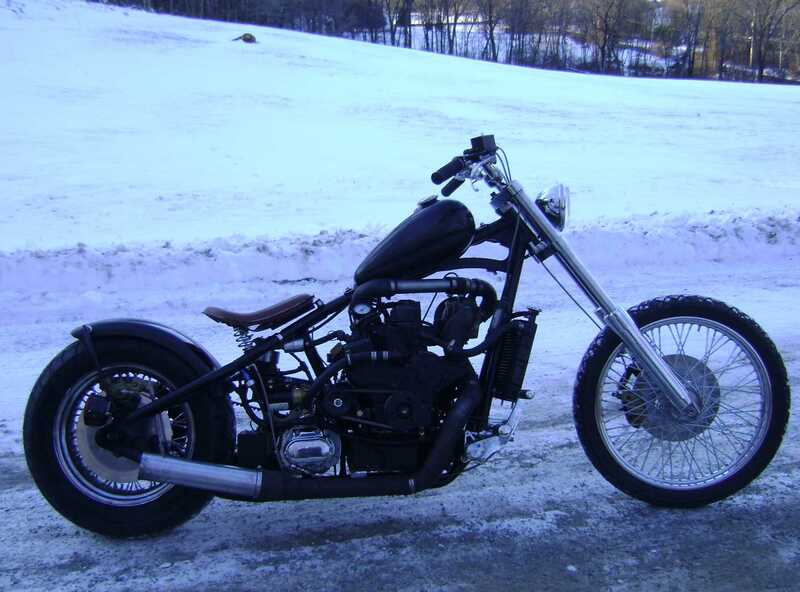 This is my project for the winter of 2009. 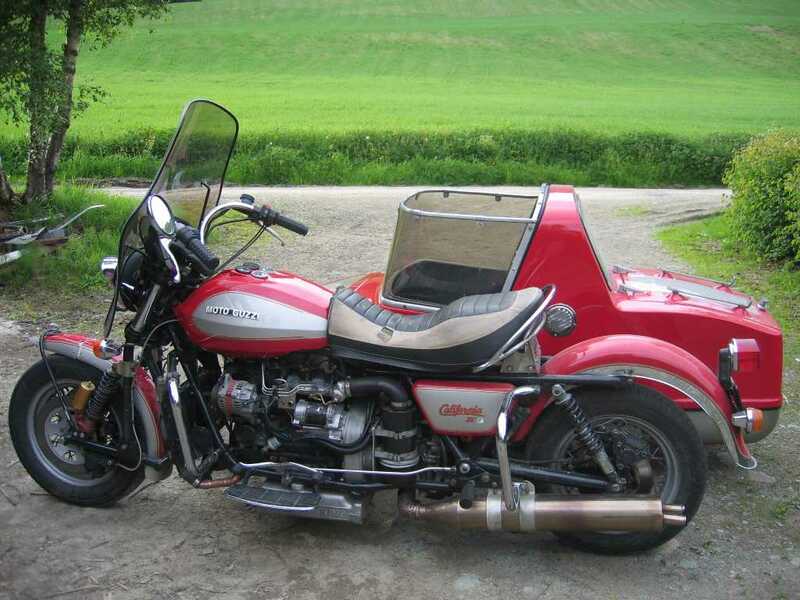 The bike is a Moto Guzzi California 2 1985 and the engine is a Yanmar from 1986 taken from a termoking ageregat. 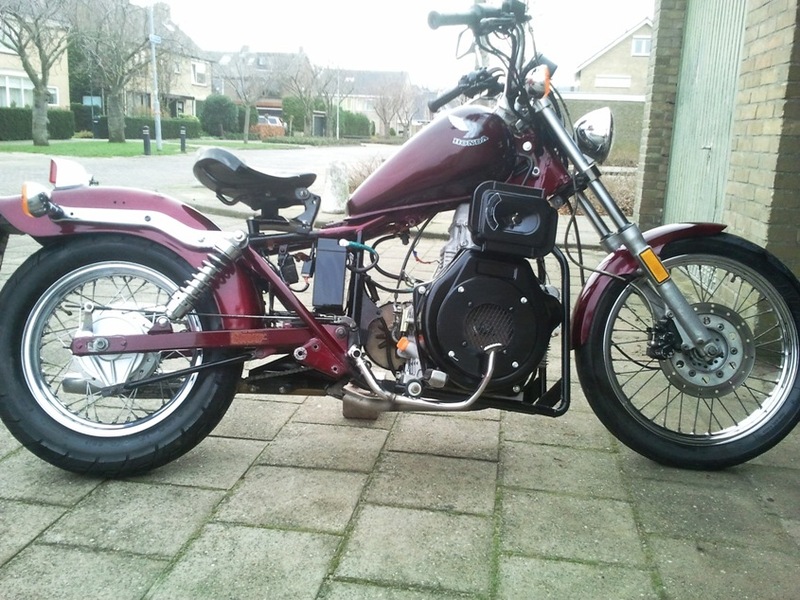 Petter's Winter project, this fabulous California Diesel motorcycle. 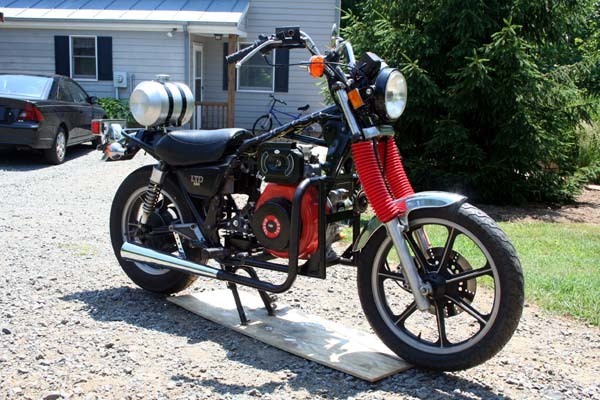 Checkout Sam's turbo Yanmar powered Dieselbike. Its a 3cyl, 958cc. Engine has been totaly rebuilt with preformance in mind. Turbocharged, injection pump modifications, pump timing advanced, all parts to spec. Turns at 4000rpm, lots of fuel, boosts 8psi under moderate load. Cool! I'm grateful to Brett for forwarding on details of another creation (he has also built the orange lombardini dnepr further up the page before this). Originally it was a 1984 kawasaki 454 ltd frame. It now has a Winsun 22 hp 812cc diesel engine with “automatic” (CVT) style transmission. Twin tank biodiesel/ svo system including pump, inline veg heater and switching valves. The gearing as she was set up for the client in Utah: Top speed- 72 mph, 138 mpg consistently. There are frame modifications, dual batteries, custom paint, "Harley" style dash which hides the fuel pump and inline heater, also keeps the veg temp gauge and switch, changed from a belted final to chain for ease and range of gear changes. Brett builds custom bikes and is based in Portland. You can contact him via the forum. His Nick is 'Roverthetop'. 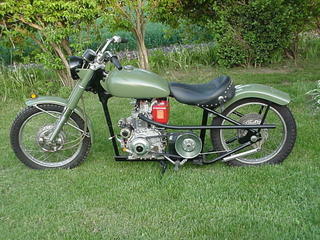 Here is my diesel motorcycle that I designed and built about 4 - 5 years ago. It is a 440cc, 10 hp diesel generator engine from China mounted on a 1982 Yamaha 650 Twin frame. Note the drive consists of a variable speed belt drive that first goes up to a shaft with bearing and sprocket that drives a chain that then turns the second shaft and sprocket that drives the rear wheel. I had to do this because it was impossible to run the power directly to the rear wheel due to the fact that the rear fork pivot was in the way. The bike has a top speed of 55mph with this gearing and gets from 100 - 135mpg. It runs on diesel or biodiesel (either B20 or B100). It is running on B100 now. It has been running very reliably since I built it with virtually no maintenance necessary. Kerry's 440cc, 10 hp Yamaha conversion can do 135 miles to the gallon. Originaly constructed by Michael Schuurbiers from the Netherlands, this Honda diesel conversion is now owned by Peter Hedman who is based in Sweden. The motorcycle started off life as a 1987 vintage Honda CMX Rebel complete with a 250cc petrol engine. It now has at it's heart a 418cc diesel Yanmar-clone engine complete with a CVT drive system instead of it's original gearbox. Pete's Website and blog. 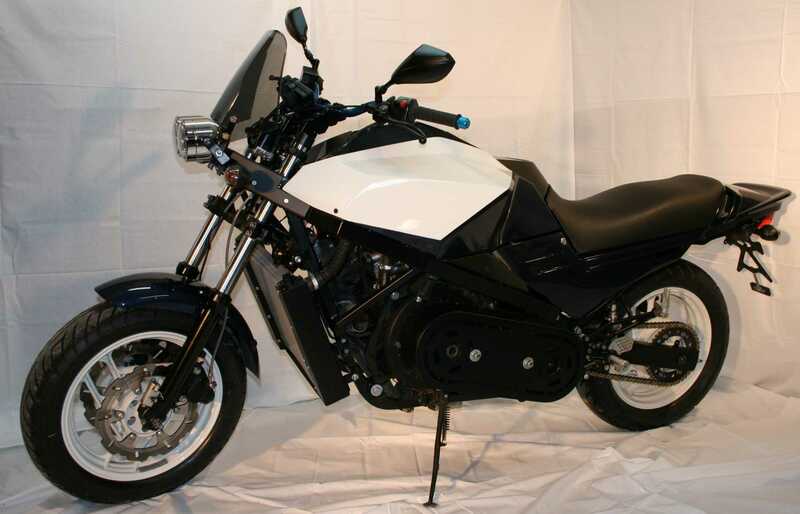 Righthand side view of the CMX Rebel Honda diesel motorcycle. A shot of the CMX Rebel showing the primary drive CVT side. 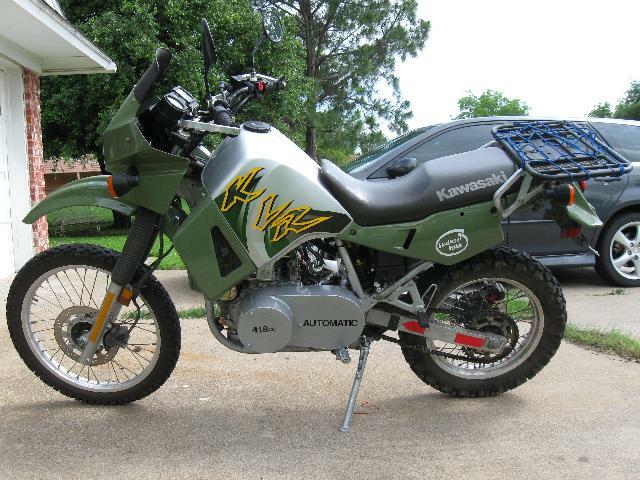 2002 KLR Diesel 418cc - Built by David Sparks. 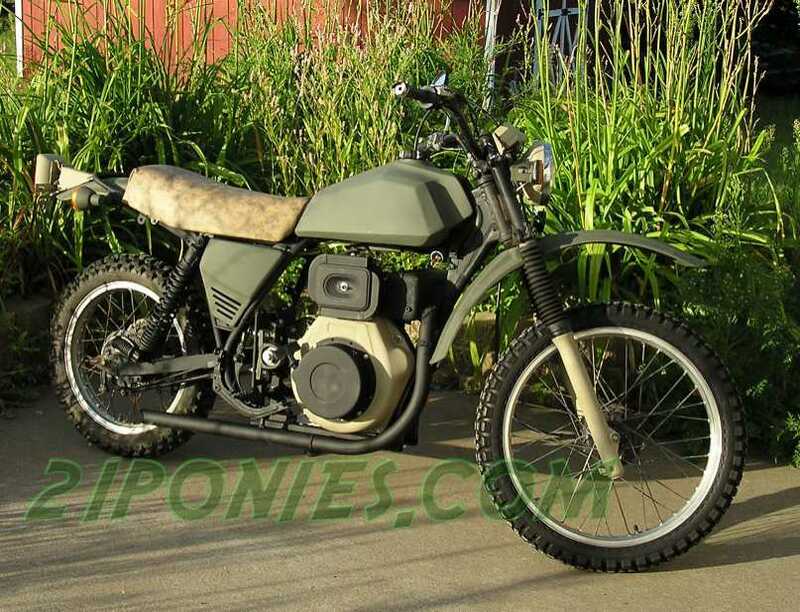 This Diesel powered KLR, with its good looks and neat build it is proving to be something of an inspiration to other builders located on our forum. 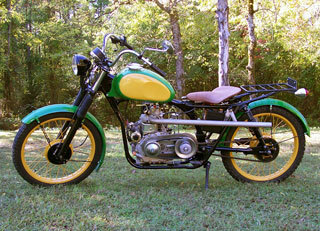 This motorcycle was built from a KLR by David Sparks of Little Elm, Texas. 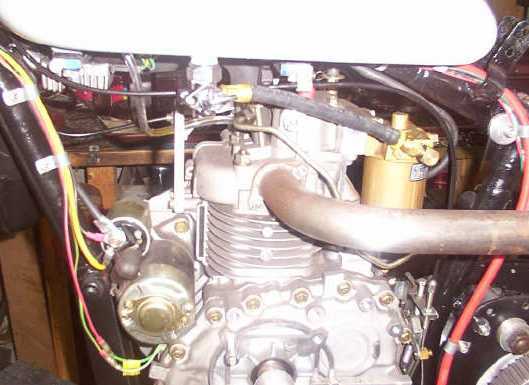 He states: "I'm using a Yanmar clone 418cc diesel engine, with a Comet 40 series convert/drive. It's both electric and pull start. At this moment, it only has 375 miles on it and still in the break in period. The top speed is about 65MPH with an average of 130MPG. I've run it on bio diesel and regular diesel. Both seem to suit it just fine. David has recently (2010/2011) sold the bike to Guy Compton. David tells me the shots were taken on his driveway back in 2009 and that it's funny to see the bike up here on the website! Thanks for the updated information, David! 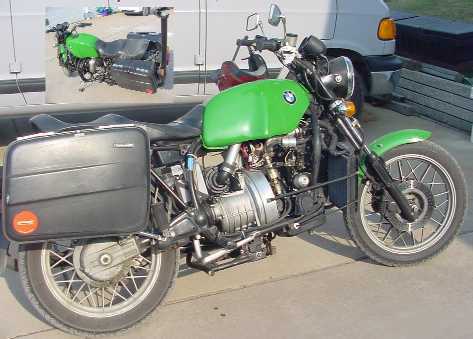 This machine came to the 2005 Hamm Rally. It appears to be a Chinese Yanmar engine inside an MZ Frame. I live just outside Edinburgh in Scotland and have just finished my diesel MZ (they are never truly finished are they ?). It started life as a 1972 MZ 250 ES TROPHY that a friend gave to me a long time ago (5 years plus) . Then one night at my local rally bike club ( SPECIAL K ) I was discussing what to do with the TROPHY and how it was so ugly it was good. Another friend said that he had two Yanmars living under his bench at work and that they were going to be scrapped, so that was how the project began. So one sorry looking MZ, two Yanmar LA 100 engines (one for spares), a box of comet cvt parts bought from e-Bay and the project was on. It was always going to be a long project because of other commitments: wife, children, friends, work, my other bikes and rallies. I have made as many parts as I could myself and what I could not do, my friends helped or the internet has proved me with. My friend Davey at spectrum bike paints (07788904946) did the subtle paint for me. Your site has proved to be a very good source of ideas and information on what can be done. Here is a list of parts I have made. There are parts that have been modified originals or from other bikes but the list is quite long. I also wired it myself so I am not so sure about how long before the lights stop working. 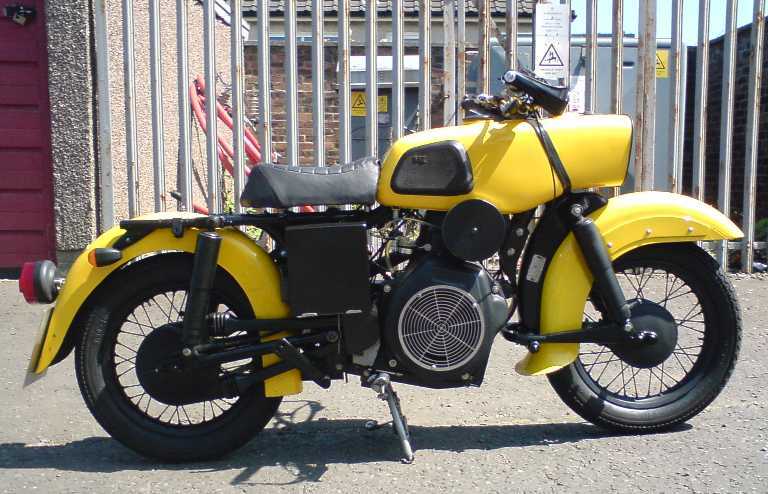 Brian Rutherford's MZ based Diesel Motorcycle. 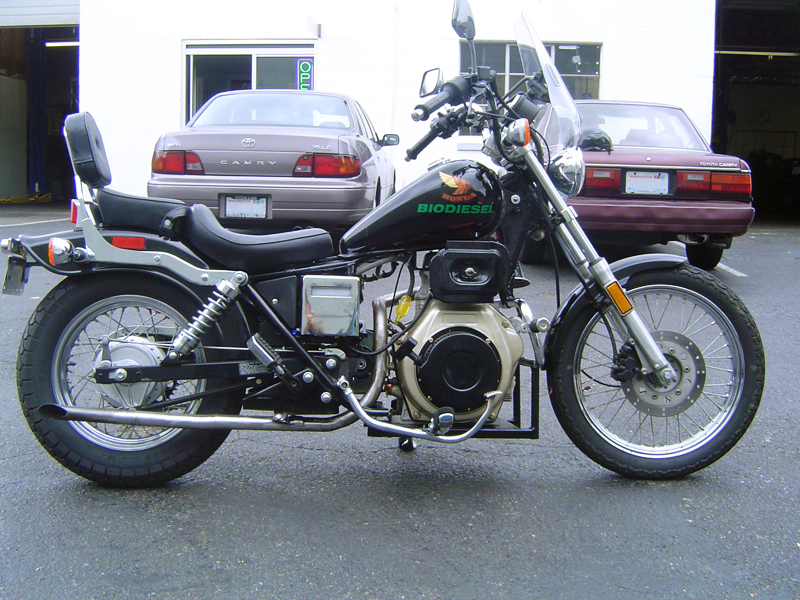 In the Summer of 2006, Dean bought this 1985 Honda Rebel and converted it to a 10 Horsepower Single Cylinder Yamar Diesel powered motorcycle. He also put an automatic belt driven transmission on it. He gets 140+ MPG and uses Bio Desiel. 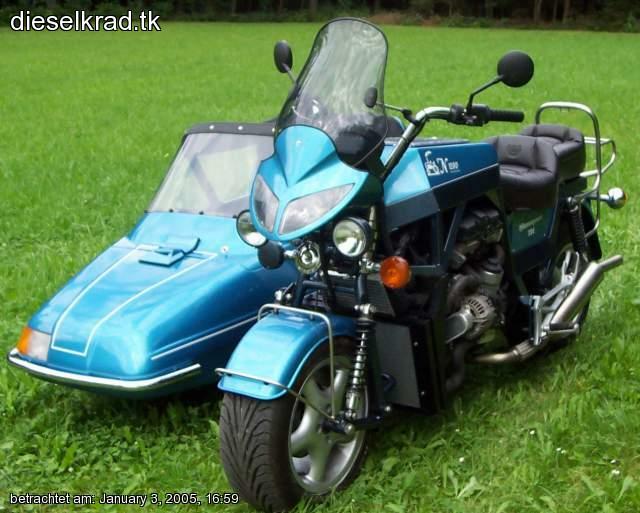 Kawasaki Diesel Bike using Yanmar Clone 406cc engine. The following text was used to describe this bike when it went up for sale on eBay. The bike was originally located in North Garden, VA, United States. 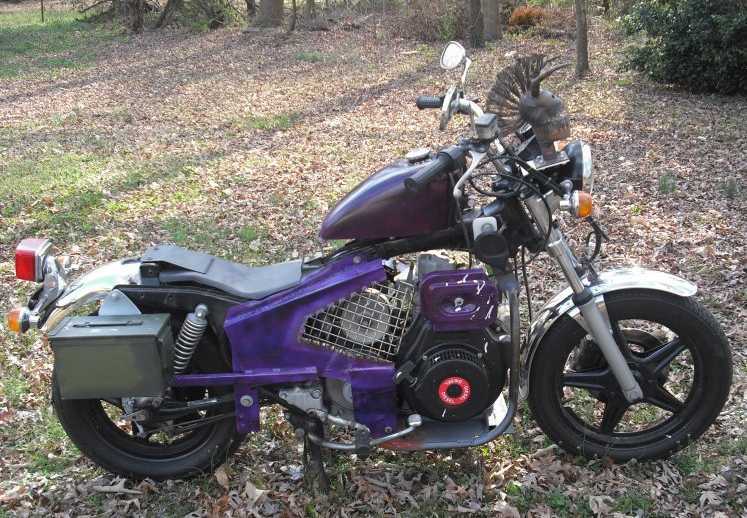 "This is a diesel conversion motorcycle built from the frame up using a 1982 Kawasaki 550 LTD. 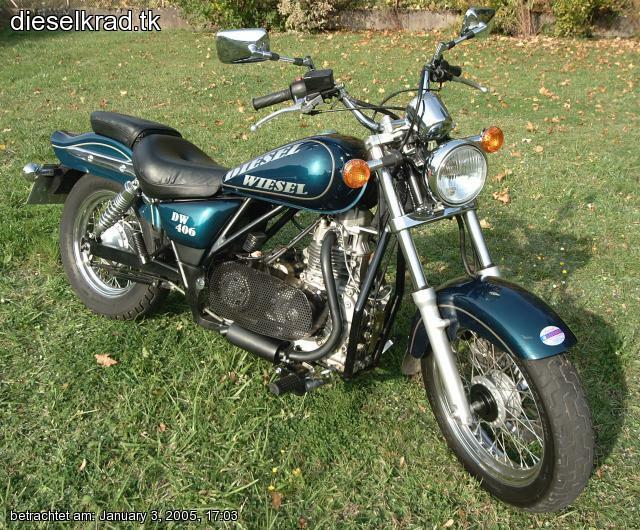 It is titled as a Kawasaki 550 LTD. The original frame was modified to accept a DEK 10 HP air cooled diesel (Yanmar clone) and a Comet 500 CV belt drive transmission-jackshaft assembly. This involved removing the forward half of the engine cradle on the stock frame and building a larger cradle to accept the new components. A professional welding shop made all welds. The completed frame was primed and painted using a high-heat ceramic-epoxy spray paint. The front forks were rebuilt using new seals with the addition of fork boots to keep out road dust. The steering stem bearings were removed, cleaned, and repacked; the swing arm received similar treatment. Brakes are original, with the front master cylinder and caliper being rebuilt prior to reinstallation. The wiring harness was custom built (one circuit at a time) and mapped-out for future reference. All lights except the headlight are LED (brake/tail) or LED-ready (turn). The seat pan was custom-cut from the original pan and professionally upholstered. The gas tank (purchased from Coyote-Gear) is mounted rear of the seat; it is a spun aluminum DOT-approved 3-gallon tank with a bottom main outlet and a separate return. There is a fuel filter and an associated cut-off valve rear of the engine’s injector intake pipe. The engine can be turned-off via this valve or by completely rolling off the throttle (which shuts off the fuel injector pump). The exhaust system features a custom-made header and flange (again professionally welded) and a chrome megaphone muffler. The bike has a manual (rope) start and an electric starter (supplied as stock on engine, I have not wired this in). Engine has a compression release for easy starts. The charging system is rated at 150 Watts. This bike is fully functional. 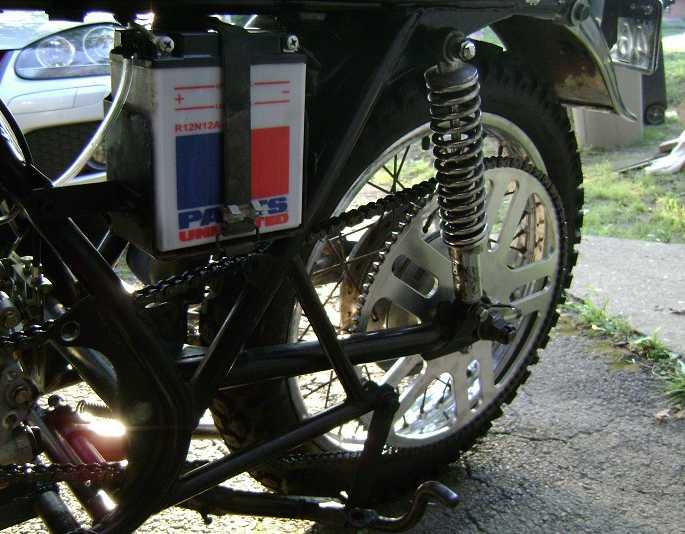 Purchaser might choose to make further refinements, for example: selecting a larger rear sprocket, connecting the electric starter, etc. This is a good bike for a person who likes to tinker. Similar designs have attained 140 mpg and 55-60 mph; I have tested this bike on my driveway but have no high speed data or miles per gallon data. Included with this bike is a copy of my journal documenting all aspects of the project (e.g. costs, material sources, schematics), a CD containing photographs taken over the course of the project, and a second (commercially purchased) CD with extensive information on diesel bike design, making bio-diesel fuel, etc. This bike represents the culmination of 2 years of design and research and several hundred hours of build-time; it could well serve as your entry to the world of diesel motorcycling and design. I built it purely for the challenge of creating a diesel bike and never intended to keep it once finished." 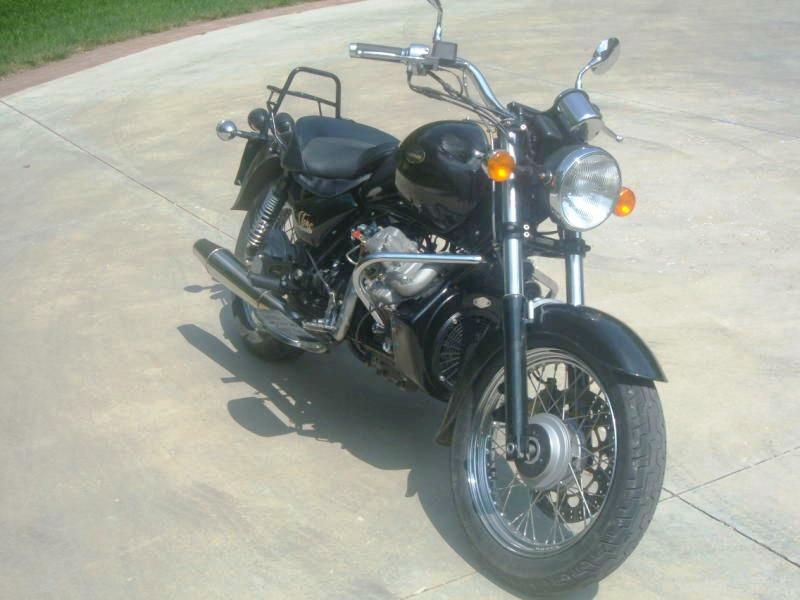 Bikes VIN is: jkakzfc11cb505599. 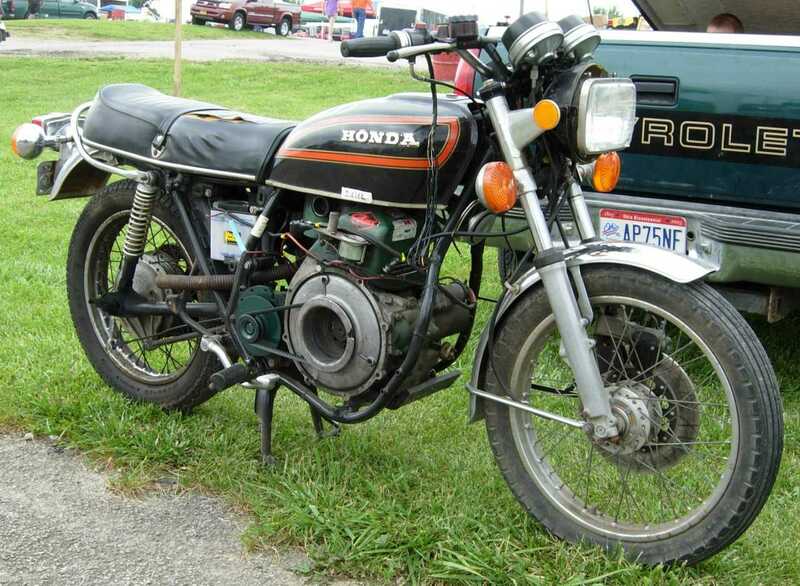 Ben's 1980 Honda CB750C Yanmar Diesel Motorcycle. 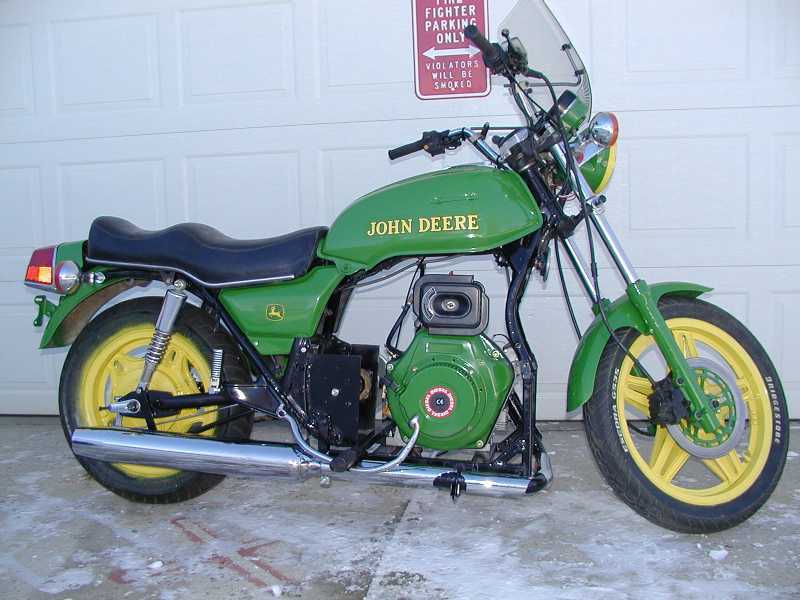 Ben's 'John Deere' styled Honda Diesel Motorcycle. clutch system to jackshaft and chain final drive. It's been tested to 95 kph. Here's the lowdown on the project. 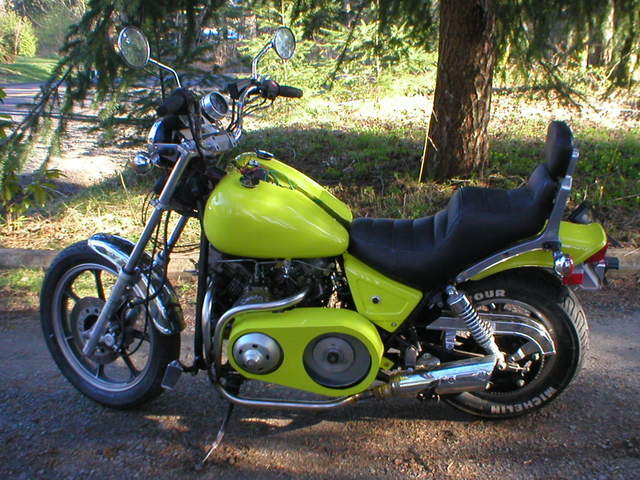 The chassis was an '86 Honda XL600 that I had available and titled. Engine is a 406cc Chinese Yanmar Clone, nominally 10hp. Transmission is a Comet 40 Series CVT to a jackshaft, then roller chain to the wheel. Frame conversion consisted of welding in a new subframe to carry the engine and transmission jackshaft, and flipping the rear wheel around to take the drive on the right side. Everything else was pretty much eyeball engineered. The bike has been retired and cannibalized pending construction of the Mark II. The big drawback to the machine was the belt drive. While it worked fine when the weather was nice, any rain would totally immobilize the thing. Enclosing the belt helped, but the clutches seemed to run too hot and belt life suffered. 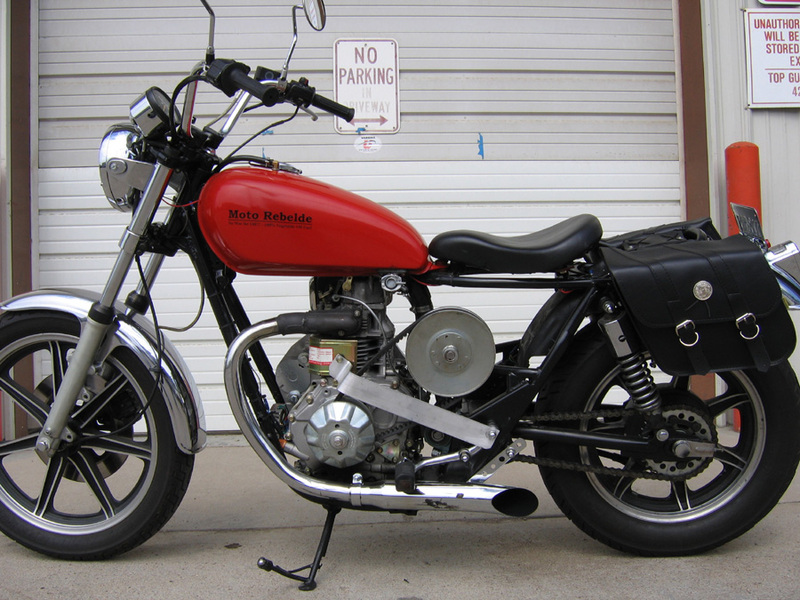 The Mk.II will be built on a hard-tail converted CB360 frame with a Burman CP gearbox from an Ariel motorcycle (possibly the only such transmission in Wisconsin.) Progress has been slow, but it should be on the road by June. The bike does 55mph max and has mpg figures of between 100 and 120 (US) gallons I presume. The bikes runs on regular diesel, bio-diesel of veg oil cut back with a little parrafin so that it will flow through the fuel filter easier. N01200 (forum name) yanmar bike. 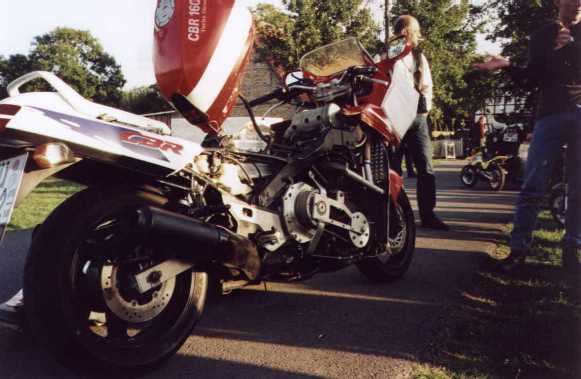 Here we see No1200's bike partly in bits although he has ridden it ok down in Australia. Not sure of the details about this bike. Not got any details on this bike. I'm not certain what the engine is even. 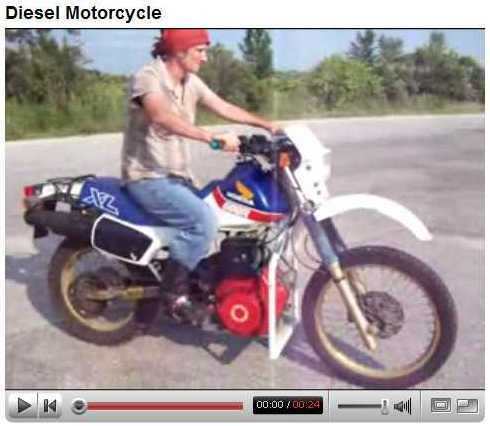 See more of this great bike in action on YouTube: Video's. 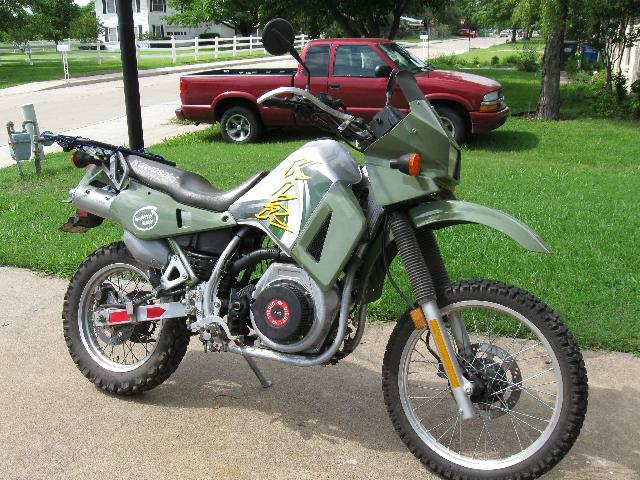 This bike was spotted by one of our forum members. We have very little knowledge about it which is why it is towards the bottom of this list. As you can see it was originally posted to - 21ponies.com. Again, this was found by one of our forum members but we have no details of the build. Looks kinda good though eh? I've not got much details on this one. I've not much info on this build. I've no info on this bike at present apart from it being made by Jerry. 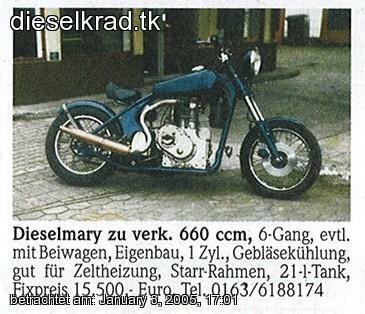 This bike recently appeared in a 'For Sale' column in Germany. If you bought it please let me know what the spec is. This bike has 1 cylinder and a capacity of 660cc.